Is there some simple way to determine how much insulation a house should have? How much insulation is enough insulation? 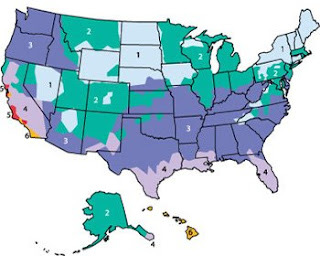 Well, each state has minimum insulation levels for each component of a house, such as walls and ceiling and floor, usually spelled out in local building codes. It is important that your house at least meet these minimum standards and if possible, exceed them. The cost of increasing or exceeding minimum insulation standards is not high and the payback is rapid. Not only do you save money on heating and cooling but you help save the environment. Here is an installation calculator from Certain Teed that is easy to use whether you are building a new house or trying to determine if your present home has enough insulation. It’s the best I’ve seen to determine R-values. An R-Value indicates insulating power or thermal resistance. The higher the R-value, the greater the insulating power. Higher R-values are more effective at maximizing your energy savings and comfort. Below are cost-effective R values of insulation based on the geographical area information for local fuel and material costs and local weather. These R values should not be used in lieu of local building code requirements. Other local data may affect requirements. Be sure and read Crawl Space Insulation! For additional information, contact your local utility and a professional insulation contractor.